Dental implants? Crowns? Veneers? Invisible braces? As dental technology and services have expanded in the Cornwall ON area, so has the vocabulary. Dentistry has advanced to provide many new solutions that address almost every possible dental trouble. In the past, if a patient had a missing tooth or a severely damaged tooth, dentists suggested dental bridges or dentures, because they were the best options at the time. These days, innovative dental implants have proven to be superior to dental bridges for most Cornwall patients. They can also be used to anchor dentures for some patients. Seamless – Fabricated to have the same shape, size and color of the original tooth, the implant will blend seamlessly with all the other teeth. If the original tooth had aesthetic problems, these can commonly be fixed with the implant crown. 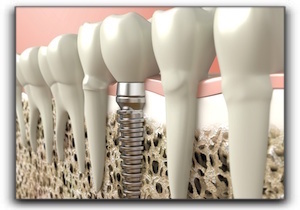 If you are interested in learning about dental implants, call us at Cornwall Dental Arts. If it is determined that you are a good candidate for the procedure, the process will begin. Plaster dental impressions of both upper and lower plates will be taken. A titanium implant, which looks like a dark screw, goes into the bone of your jaw. Over the next couple of months, the bone and implant will bond together to form a substitute root for your new tooth. After the required time has passed for bonding of the bone and implant, an extension (called an abutment) is placed on top of the initial implant post. This post extension is then capped with a temporary tooth. Meanwhile, the team of professionals at our lab will shape your new, permanent crown. Then we will put the permanent crown on top of the full post. This tooth will match your other teeth to create an extraordinary new smile. You will find that the comfort is the same as your natural teeth, to the point that you may even forget which tooth is the implant. The upkeep is the same, with brushing, flossing, and regular check-ups required. To find out whether a dental implant is right for you, call Cornwall Dental Arts for more particulars. We also provide cosmetic dentistry. We look forward to meeting you!